While many people shy away from making cream sauces because they believe them to be difficult to execute, these sauces are relatively simple if you understand the basic techniques behind cooking them. Most white and other cream sauces are variations on béchamel, which starts with a roux. When you want to find a terrific white sauce recipe, LoveToKnow Cooking can be your go-to resource. White sauce favorites: Discover how to make traditional white sauce, as well as supreme sauce, bread sauce, and veloute sauce. Colorful variations: Cream sauces don't have to be white; try your hand and brown sauce and green (and super-spicy!) Poblano cream sauce. Veggie sauces: Delicious celery and cauliflower sauces are both perfect options for cooks looking for ways to "sneak" disguised vegetables into their family's diet. 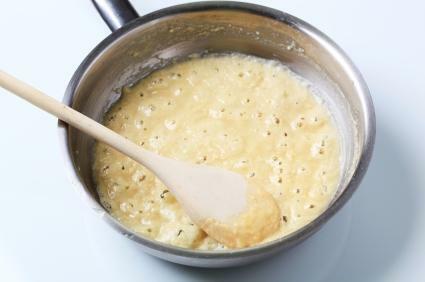 Dessert sauce: Learn how to give any dessert an extra bit of sweetness by adding a drizzle of homemade sweet cream sauce. Breakfast delight: Find out how to make eggs and bacon with cream sauce, a perfect breakfast or brunch selection. Perfect poultry: Discover how to make chicken in white sauce and codfish in cream sauce. Elegant pasta: Discover how to take a tried-and-true favorite to a new level with this macaroni with cream sauce recipe. There's no reason to be intimidated by the thought of creating homemade sauce. With the wide variety of easy-to-follow recipes available on LoveToKnow Cooking you can master the art of simmering sauce - from simple concoctions to elegant alla panna sauce - quickly and easily in your own kitchen!